WASHINGTON (AP) — Alaska Sen. Lisa Murkowski, the lone Republican who voted against advancing Brett Kavanaugh’s Supreme Court nomination, has carved out a path as a fiercely independent senator known for bucking her party. But she didn’t look especially happy about it Friday. Murkowski suggested she will oppose President Donald Trump’s Supreme Court nominee this weekend after she became the only GOP senator to oppose advancing Kavanaugh’s nomination during a tense, high-stakes Senate floor vote. The Alaskan senator’s vote was the latest example of the independent streak she forged since overcoming a Republican primary challenge in 2010 to win re-election as a rare write-in candidate. She was re-elected in 2016. Murkowski has expressed unease with the sexual assault allegations lodged against Kavanaugh, which he denies. She has faced pressure from home-state Alaskans, including Native Alaskan women, who have described the scourge of sexual assault. After remaining undecided on whether Kavanaugh’s nomination should move forward, Murkowski rendered her decision Friday in dramatic fashion. As the clerk read the names in alphabetical order, all eyes were on Murkowski. Senators stood up in their chairs and voted, some of them loudly. But when it came to Murkowski, she stood up, paused, and whispered “no,” her voice barely audible. Then she took her seat, looking down with a stone-faced expression. As the end of the vote neared, Maine Sen. Susan Collins, who sits next to Murkowski, leaned over and put her hand on the arm of Murkowski’s chair. The two huddled in deep conversation. Collins and Murkowski are the only GOP senators who support abortion rights, a crucial issue in the debate over Kavanaugh’s nomination. If confirmed, Kavanaugh could tip the court’s balance toward conservatives for a generation. Collins said Kavanaugh assured her during a private meeting that Roe v. Wade, the ruling that established abortion rights, is settled law. When Friday’s procedural vote was over, Republican Sen. Rob Portman of Ohio came over to Murkowski and took her hand, shaking it. Texas Sen. John Cornyn, the Senate’s No. 2 Republican, who has been aggressively lobbying undecided senators to vote for Kavanaugh, also came over and touched Murkowski on the shoulder as they spoke. Several Democrats conferred with Murkowski as well, including Minnesota Sen. Amy Klobuchar. As senators of both parties left the chamber, many lined up to talk to the two women. 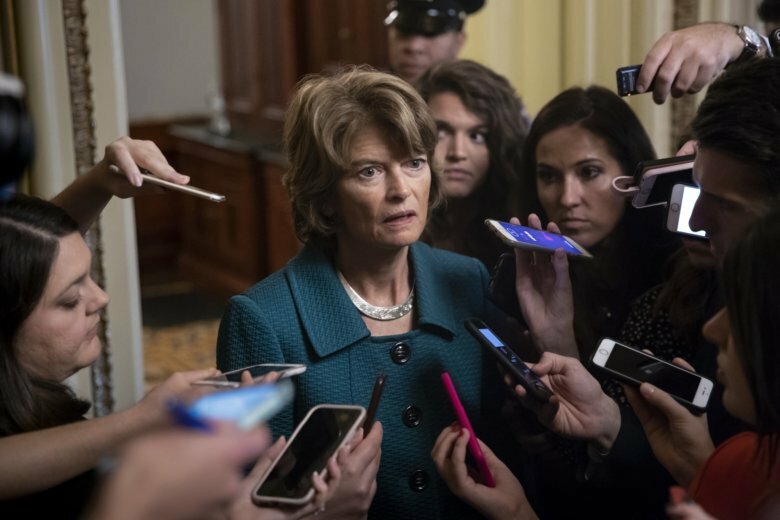 Murkowski’s decision brought a swift response from former Alaska Gov. Sarah Palin, who insinuated that she might mount a primary challenge against the senator if she opposes Kavanaugh. Palin, who was GOP presidential candidate John McCain’s running mate in 2008, tweeted, “Hey @lisamurkowski — I can see 2022 from my house.” The tweet referenced an infamous “Saturday Night Live” skit in which Tina Fey, portraying Palin, said she could see Russia from her house. Murkowski is next up for re-election in 2022. A spokeswoman for Murkowski could not immediately confirm that the senator will oppose Kavanaugh on the final vote expected Saturday, but indicated it appeared that way. Kavanaugh could still win confirmation if Murkowski is the only Republican to oppose him. Murkowski acknowledged she agonized over her vote, telling reporters she didn’t make up her mind until she walked into the Senate chamber. “This has truly been the most difficult evaluation of a decision that I’ve ever had to make, and I’ve made some interesting ones in my political career,” Murkowski said. Associated Press writers Mary Clare Jalonick and Matthew Daly contributed.